Truth be told I am cable agnostic which is not anti-cable but more of a doubting Thomas scenario. Often personal confirmation through my own ears is the only way to be able to say with any confidence that the arguably anecdotal statement “cables make a difference” has any degree of validity. Even then the observable difference will be affected by the quality of the gear being used and the particular use scenario. Sometimes they make a difference, sometimes they do not but in nearly all cases the qualitative difference will be down to your own methodology and gear, including the previous cable you use, thus making the discussion entirely personal or contextual. As such, the same cable in your hands may end up with a vastly different result (both positive and negative) to it being in my hands. It was with some internal deliberation then that I agreed to work on a review of Audio Art’s new analog headphone cables. First, having worked on countless IEM cables and some headphone aftermarket cables, I have found that quite a lot of analog headphones or IEM cables can change the sound either drastically or subtly. And that second, they just look so much nicer and better built than some of the stock cables that come with my headphones so that at least on an aesthetic level they will add something to my headphone experience. And I am glad I did go for it because after countless hours and days swapping back and forth the improvement was quite obvious and enjoyable though in other cases the improvements were very subtle indeed and perhaps questionable. What I like about Audio Arts pitch is the affordability aspect of these cables, especially if you are using say an LCD-2, HD800 or Hifiman HE1000 and want to upgrade from the stock. Quite a lot of that is out of Rob and his team’s conviction that you don’t have to spend a lot to get a desirable improvement out of cable changes as well as their direct business model reducing logistical chain margins. These cables are priced at $295 – $350 for 5 feet which is a fairly standard desktop length and places them at the mid-tier level. Whilst they are clearly above stock replacement cable pricing they are not hugely so when you consider Sennheiser sell their HD800 stock for over $200 in some outlets, Hifiman price their stock cable at $199 and Audeze retail theirs at $80. The second pitch is something I am quite partial to being a distance shopper myself and that is the 30-day money back guarantee on the cables. All Audio Art Cable products come with a 30-day satisfaction guarantee and a 1-year parts and labor warranty covering any and all manufacturing defects. That is as good as it gets in the boutique business model and it does give you important time to ascertain if indeed the cable is the right choice for your system or not. Let’s hear more about you and Audio Art – Why did you get into this business? First of all, let me say thank you, Marcus, for taking the time to evaluate our new HPX cable, and for writing this review. I think a life-long love of music, and playing records and tapes every chance I got on home and car audio systems when I was young is where it all started. I grew up listening to Classical music and show tunes on my parents Fischer console, and the Beatles, Doors, and Elvis on 45’s my sister would play. I was hooked! I bought my first hi-fi system in 1978, and have been a devoted hobbyist ever since. Over the years, I sold consumer electronics and worked in the custom A/V install business. I decided I wanted to own a business in the early 2000’s, and to looked into marketing a branded product in the audio industry. I had a lot of support from my wife, I had contacts in the industry, made a few calls, and decided to give cables a go. I had always had a fascination with how cables could make a difference, and improve the performance of an audio system. What specific goal do you have with your cables? Offering audio hobbyists a competitive product, at a value-oriented price, that improves performance is goal number one. I have no intentions for Audio Art to be the least expensive cable brand, but rather a brand that is in the conversation with well recognized and established brands. We want to offer more quality and better performance at the same We want to offer more quality and better performance at the same price or to offer comparable, even superior performance for less. Direct to consumer sales is the best way to accomplish this. We also pride ourselves in using some of the finest quality parts and cable materials available today and have exclusive designs. Another key element is we utilize the services of one of the finest production tech’s in the business to do our assembly work, Phil Martinez. Phil a true artisan, and he gives our product a real “custom-shop” look and feel. He’s also the former production manager of both AudioQuest and Audience, and Audio Art Cable is fortunate to have him on staff. It’s our goal that anyone who purchases an Audio Art Cable product is not only thrilled with the performance of our products and their results but also are completely satisfied with the quality of the product, as well as our level of customer service. I see the headphone cables are not yet on your website – how would you pitch them to our readers in 2-3 sentences max? Our new HPX-1 headphone cable offers the same high-performance, value-oriented Audio Art Cable experience as the rest of our line-up has for 12 years. With a variety of parts and connector options, cable covers, and lengths (including custom), we have something to fit most every budget, and every audio enthusiast’s needs, at a great price. And by the way, we’re launching a new website which will feature the HPX, plus other new cable models mid-2017. What makes these cables different to stock cables, for example, Audeze stock compared to your version? The connector parts, cable, and other materials used to make HPX will be superior, so the cable should both look and sound better. I think our Audedze LCD Series cable offers much better performance than the stock cable in terms of resolution and imaging, as well as a more sophisticated presentation. The stock cable sounds somewhat opaque in comparison, it simply leaves too much musical information the table; our cable will squeeze out more of what’s on the recording. Our gold plated beryllium copper mini-xlr also fits the Audeze LCD socket more smoothly, it’s easier to mount and dismount. What materials do you generally prefer to work with and why? With our wires, we use only high purity ofc and OCC copper as well as high purity silver conductor materials. Sonically speaking for insulation, we prefer a more musical sounding foam polyethylene for signal wires and PVC for power cables. Quality shielding for interconnects, power cables, and headphone cables is also very important to keep noise artifacts out of the signal path. Lastly, and very importantly, if we consider the “best connector” to be “no connector” in a high fidelity audio system, and with this philosophy being largely impractical when connecting components, I’m a firm believer in using top-quality connector parts. Sonically speaking, the best connector is a performance oriented connector. An inexpensive connector part made of less than ideal conductive metals used to drive the price of the finished cable down, and the profitability up, is simply not going to optimize the potential of a high-quality wire. The HPX-1 series uses a single HXP-28 cable at the heart with multiple external design options and terminations. 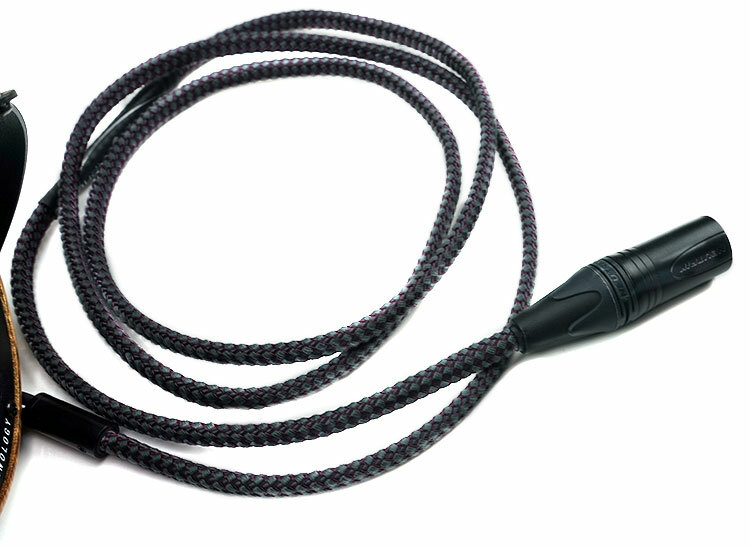 The HXP-28 cable design features 2 paralleled cables with twin 28 AWG OCC Copper conductors in each cable insulated with PE dielectric and a braided silver plated OFHC copper shield. 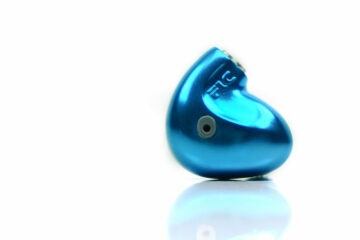 The intention of this design was for both high-resolution audio performance, and rugged durability. OCC stands for Ohno Continuous Casting and differs from OFC which stands for oxygen free copper. The key difference between both is in the manufacturing and cable building process which, in the case of OCC, is designed to produce fewer crystal boundaries in the copper wire than other variants. Crystal boundaries act like tiny diodes, causing non-linear resistance, so hence the lower the boundaries the lower the resistance which, in theory, is a good thing for analog cables. The finishing options, in terms of terminations and sheath materials, are plentiful. You can have the cable either balanced or unbalanced or in my case, all came balanced with a short unbalanced converter cable made from matching materials and wire for additional flexibility. The terminations are really up to you but in this case, we went for Sennheiser Lemo proprietary connectors, Audeze mini-XLR and Hifiman 2.5mm stereo terminations. 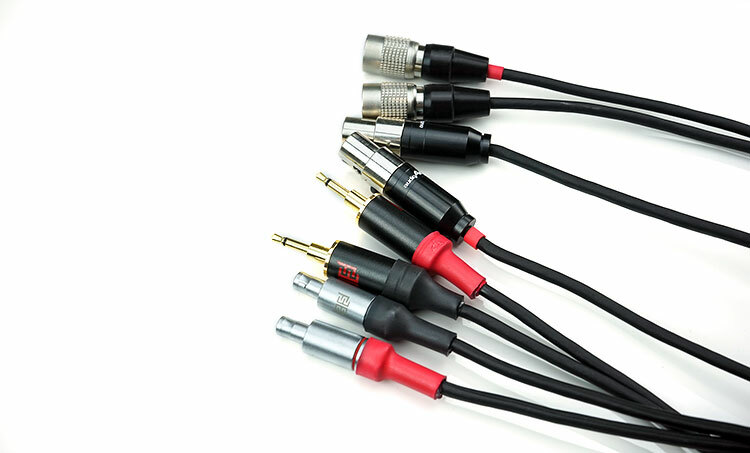 The specific plugs used on the input side included Neutrik NC4MX-B 4-Pin male XLR for the main cable and a Neutrik NC4MX-B 4-socket female XLR Neutrik/NP3X-B 1/4” Stereo plugs for the converter cable. For the connector end the Audeze connectors were Audio Art branded but these felt super smooth and much easier to insert and extract from the mini-XLR connectors on my LCD-2 than the stock connectors. There was very little friction if any and a super clean “click” sound when properly connected. The HD800 connectors are Eidolic branded Lemo connectors and these are not cheap either at around $50 a pair on the open market. These connectors feature a fairly large laser-engraved cylindrical barrel with a 5.5mm rear opening and known for excellent heat tolerance. They also look stunning. Audio Art has used Eidolic 2.5mm plugs for the Hifiman HPX-1 cable terminations. These are beautiful plugs with gold and brass connectors, a black anodized aluminum 10mm engraved barrel and a huge 8mm rear opening. The main barrel itself sits back a little from the contact jack area so they are bulkier than the standard Hifiman jacks but they are designed as such to take a wider variety of cables in terms of thickness. With the three cables sent we receive them in two sleeve material variations. The first was a custom carbon color weave with a Berry PET Thread. It is understated but classy looking and certainly a higher quality of sheath than say, the Wywires Red Series red weave, but it is also stiffer and heavier. I get a sense that these are very well insulated and will take plenty of abuse before falling apart. The second variation is a black Techflex braided PET sleeve which isn’t quite as intricate as the carbon and berry combo or as visually eye-catching but nevertheless has the same slightly stiff and heavy duty property that would give me confidence it wouldn’t start to fray or fall apart during sustained use. All sleeves have rather classy and very sturdy looking aluminum barrel splitters. The carbon and berry variant has a longer black barrel which blends in nicely with the look and feel of the sleeve. The black Techflex sleeves have a stubbier but more striking short barrel silver aluminum finish splitter which I just love. All of these plugs are soldered using high-performance Cardas Quad-Eutectic solder. Quad-Eutectic solder contains a proprietary blend of silver, copper, tin & lead though you can get a lead free version and is a big step up from generic solder in terms of solidity and conductivity. There is nothing worse than a good quality cable being terminated with very impure solder as it essentially defeats the purpose of the cable. Since the HPX-1 line is a very new product the packaging is still in development stages so if you order right now you get the cables in a quality 4 mil zip-bag but nothing more. I do hope down the line you get something like a box or display case like the relatively cheap Xindak cable presentations. Maybe a touch of satin to enhanced the display would be the cherry on top. Beyond that, you get a welcome letter and company business card from Rob Fritz himself, a branded cleaning cloth vacuum sealed and a little promotion flyer introducing you to the rest of the Audio Art cable range. 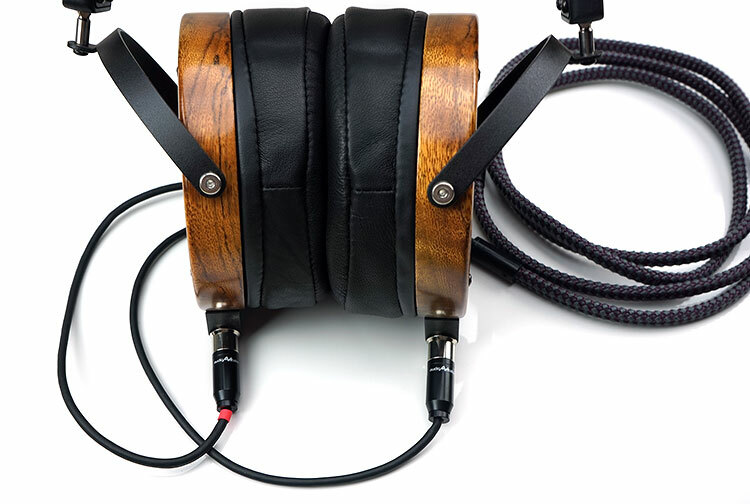 Each cable will bring to bear its own unique synergy with each headphone so there are certain aspects peculiar only to that headphone but after listening to all 3 you could pick out certain qualities of the HPX-1 tonality that seem present in all three. The first is the general smoothness which is something that a copper cable is well known for. The HPX-1 does not go overboard though so it will smooth out certain areas such as treble glare or sibilant tendencies but it will retain the articulation and detail and sound very controlled rather than overly warm. 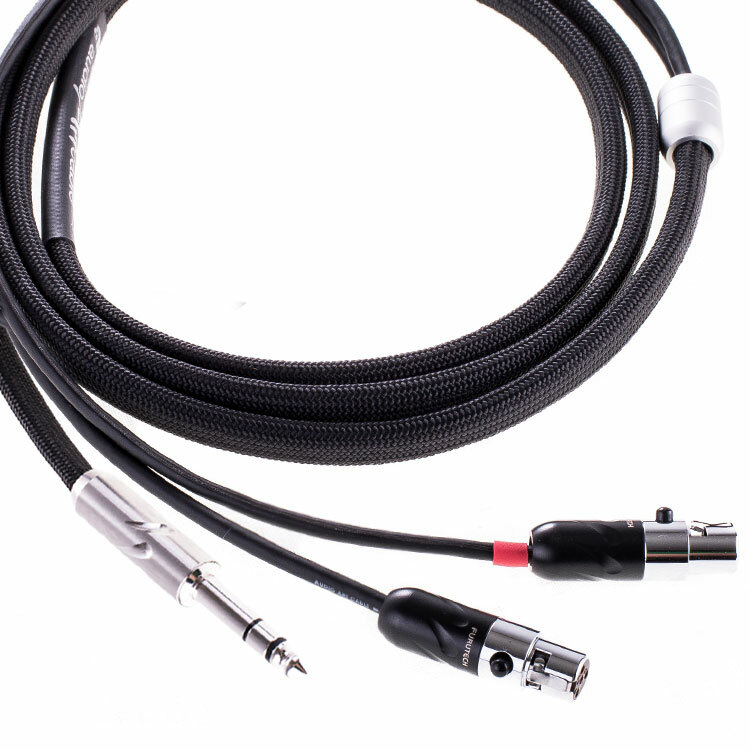 Second, this cable is also a “peppier” sounding cable than some others in the lower treble and at times I found the HPX-1 to have a livelier upper mid-range and lower treble but without any unwanted peakiness or glare. The final common quality is the imaging, particularly instrumental positioning as well as spatial cue awareness. Micro-detail on all headphones using the cable was excellent, much superior to most of the stock cables with an enhanced staging quality particularly in terms of width over depth. The superior dynamics on the HPX-1 will contribute greatly to the staging quality, particularly with the LCD-2 but also in terms of bass snap and definition with headphones such as the HE1000 V2. A trivial question, maybe to some. 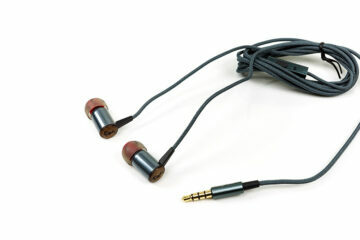 Can any headphone be turned to balanced by swapping the cables and plugging them into a balanced output, say dac/amp? I recently bought a 1more Triple Driver on-ear headphone along a Fiio Q1 mk2 dac/amp (which has a 3.5mm unbalanced and a 2.5mm balanced outputs). A very thorough review. In my case I have the Sennheiser HD800S, which has smoother treble than the HD800, with the overbrightness somewhat tamed. You say the HPX-1 cable is “sweeter” in the treble than the stock cable with the HD800. Will it have the effect of subjectively rolling off the treble of the HD800S? It is a good question to which I do not as yet have an answer since there is no HD800s here.. yet. It won’t roll off any treble though, just soften the leading edge around that peak.